Downgrade: How State Credit Ratings Could Impact The 2016 Race : It's All Politics How well a governor has handled his state's finances can help or hurt him. That's especially true in a presidential campaign when nine current and former governors could vie for the White House. 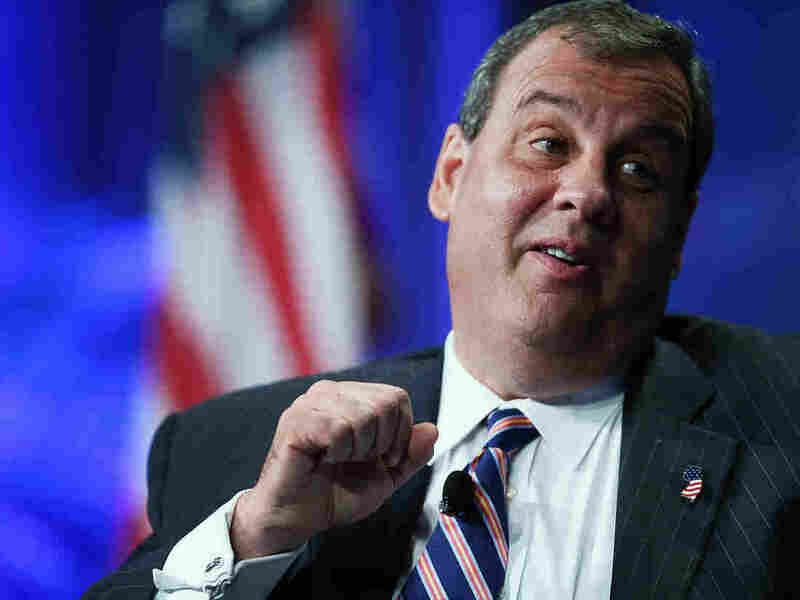 New Jersey Governor Chris Christie and possible Republican presidential candidate speaks during the Rick Scott's Economic Growth Summit on June 2, 2015 in Orlando, Florida. In the race for the GOP presidential nomination, Rick Perry is getting in Thursday, and both Jeb Bush and Bobby Jindal have announced that they have announcements to make. All three have a statistic in their arsenal that almost no other candidate in the race can boast: while they were governors, their states received credit-rating upgrades from the major rating agencies. Those ratings are one proxy for a state's financial and economic health, and candidates often use them as talking points — or weapons — on the campaign trail. NPR analyzed state credit ratings during the tenures of those seven governors, as well as the two Democrats who are running. Jindal, by far, oversaw the most credit upgrades during his more than seven years in office. During his tenure as Louisiana governor the three biggest credit ratings agencies upgraded the state's credit six times. At the lowest end of the spectrum, New Jersey Gov. Chris Christie had nine downgrades — three by each major agency. Think about state credit ratings as being like a person's credit score — a measurement of credit risk. A state credit rating is a measure of how likely a state is to pay on its debts. When the rating is better, the state gets lower borrowing costs. When a rating drops, it usually means higher borrowing costs. The three most-watched rating agencies are Moody's, Standard & Poor's, and Fitch. And those ratings are on lettered scales, ranging up to AAA down to D in the case of S&P and Fitch (and, similarly, Aaa to C for Moody's). They also come with modifiers — pluses or minuses at S&P and Fitch, or the numbers 1-3 at Moody's — so AA+ is better than AA, and Aa1 is better than Aa2, for example. So you can consider this one rough barometer of a state's fiscal health under various governors. Of course, there are a lot of caveats with this sort of count — some governors, like Perry, served especially long terms, meaning they had more time to accrue more ratings changes. And just because a governor hasn't had any change isn't a bad thing — after all, Maryland had top marks at all three agencies throughout O'Malley's tenure. So you can say Jindal has the most upgrades, but declaring "best record" is trickier. Credit ratings have already become a 2016 talking point — Democrats have already run an ad this year mocking Christie's many downgrades. So what does this tell you about a governor? Can you pin all of the blame on Christie for his state's fiscal problems? Absolutely not, one expert said. "The credit-rating agencies are taking a fairly long-term view," says Don Boyd, director of fiscal studies at the Rockefeller Institute, a public policy think tank at the University at Albany, State University of New York. Because they're assessing the state's ability to pay its long-term debt, which can come due decades in the future, the agencies can't be so short-sighted as to focus solely on the current governor, who might be out in a year or two. Moreover, Boyd adds, governors don't have a lot of control over their state's economy — they can try to nudge job creation, but if a state relies on oil production and oil prices plummet and jobs disappear, a governor can't really stop that. The economy is one of four main things agencies focus on when they decide on state ratings, Boyd says. The other three are long-term liabilities, the government's budgetary performance, and how well the state is managed. (Roughly speaking, is the government getting stuff done?) The governor does have some influence on those things — on the last two, an arguably heavy influence. And sometimes, a governor's specific decisions do come into play in a state's credit ratings. When it downgraded New Jersey last year, for example, S&P specifically faulted Christie for failing to keep his promise to pay $2.5 billion extra toward the state's pension fund. Christie inherited a huge budget shortfall, it's true, but S&P in this case faulted him for not doing more about it. As 2016 approaches, doubtlessly the GOP candidates will be touting their fiscal bona fides as they try to take charge of the U.S. at a time when debt stands at 74 percent of GDP. That grew steeply in recent years, in large part, because of the government's responses to the financial crisis. Governors usually run on their executive experience when they're running for the presidency. And maybe it works — five of the last six presidents have been governors. But that experience can alternately be a blessing or a curse: the eight current and former senators running for the presidency simply don't have these sorts of numbers to tout — or run away from — as they campaign.